The late 1940s and 1950s marked an era of change as Britain recovered from the world war. Initial austerity made way to optimism and an explosion of style and colour as a new generation determined to throw off the dark days and look to the future. But many people who became parents for the first time in the 1950s had grown up during the long conflict, or had seen service horrors abroad during their military service. They wanted better for their children, but also demanded better value for money. F.W. Woolworth was there to help, with a wide range of the latest toys at thrifty fifties prices. The stores could boast the best range on the High Street and were proud to be the nation's favourite. In the run-up to peak times like Easter and Christmas it seemed that the whole nation descended on Woolies and waited patiently for their turn to be served. On this page we look at some of the toys and games that they bought, and the prices that they paid. On this page we show some of the toys that today's grandparents used to play with when they were children sixty to seventy years ago. 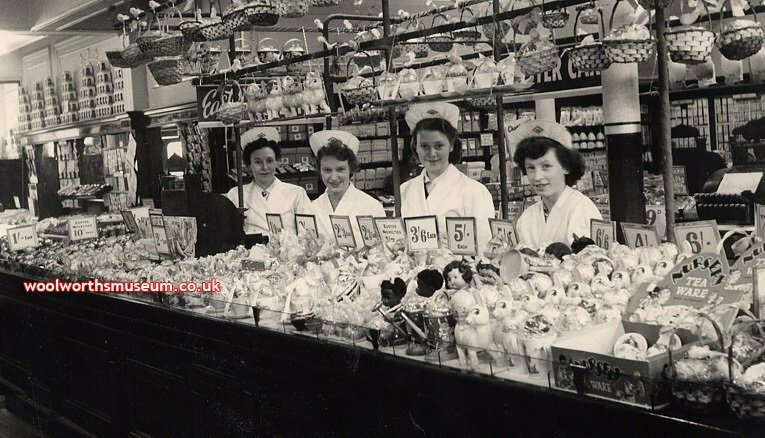 We have chosen some of the displays from Woolworth's counters between 1949 and 1959. It was a period of great change, as the chain adapted to new market conditions. Before World War II everything had cost sixpence or less; this was 2½p at the time and the equivalent of £2.11 today. Manufacturing costs had rocketed as Britain prepared for War, bringing the maximum limit to an end. 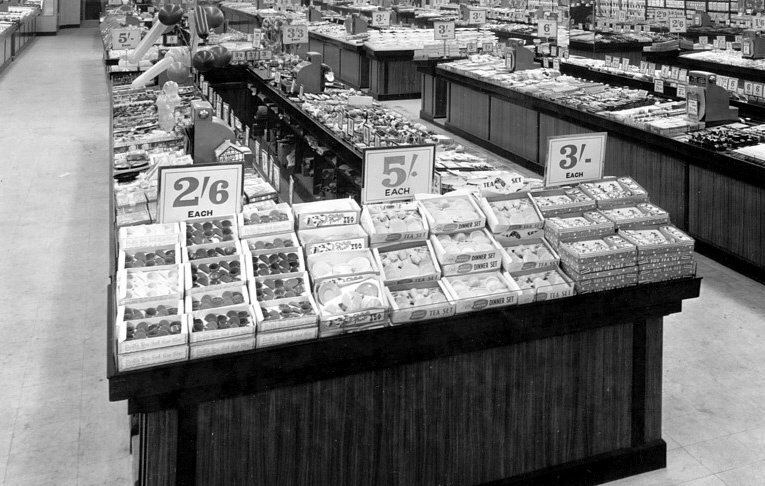 After the long conflict, as goods became available again, the Woolworth Buyers were free to choose a broader range to meet the demands of a new generation. 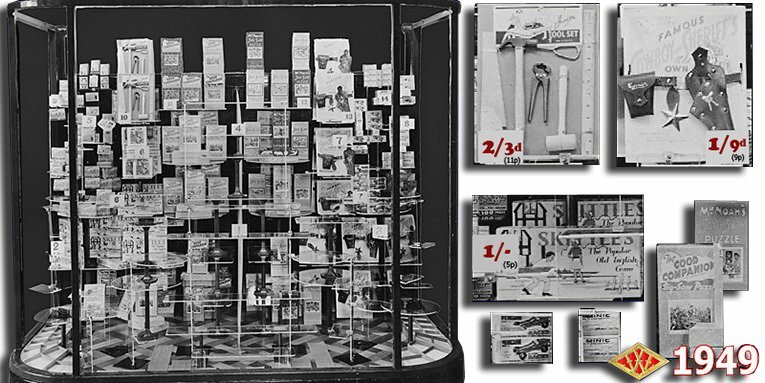 Our first picture shows a window display from 1949. At the time the range was limited as a result of government austerity measures, as the country exported as much as it could to help pay off the debts incurred to fight the World War. The toys shown include a mixture of traditional favourites and new lines. At one end of the spectrum Mr. Noah's Cardboard Jigsaw Puzzles were still sixpence, while Good Companion Jigsaws, which were to become a particular favourite during the Fifties and Sixties, had wooden interlocking pieces. The price of two shillings was four times the pre-war maximum, and was the equivalent of 10p at the time, or about £3 or $5.50 today. Alongside the traditional game of skittles, selling for one shilling or 5p (about £1.50), new items in the range included Carpentry Sets, with well-made tools for for two shillings and threepence (11p), and a 'Cowboys and Sheriffs Set' for one shilling and ninepence. Before the war items like these had been sold individually, without packaging, to keep within the maximum price. By 1951 some of the austerity measures had been relaxed. Some of the stores destroyed during the Battle of Britain had re-opened. The new premises were larger and brighter. The Buyers went to great lengths to stock them new and exciting ranges. The picture above shows some of the most popular items for little girls. Prices for the dolls tea sets vary from two shillings and sixpence, which was called 'half a crown' and was the equivalent of 12½p, up to five shillings (25p). Following a tradition started before the War, in the distance the counter is marked out with balloons. The next picture shows the boys range from the same year. The items include 'O' gauge clockwork trainsets in the foreground, which were seven shillings or 35p (around £9 today), arrow trucks for six shillings (30p) and ball throwers and catchers for two shillings and sixpence (12½p). There are also dolls from the firm's 'Nursery' range towards the top right of the picture. Several of the items shown are made of plastic. The new material progressively replaced bakelite and celluloid during the decade. Plastic allowed toy models to be more accurate and to be finished in much brighter colours. It was also less fragile than bakelite, which tended to become brittle as it got older. 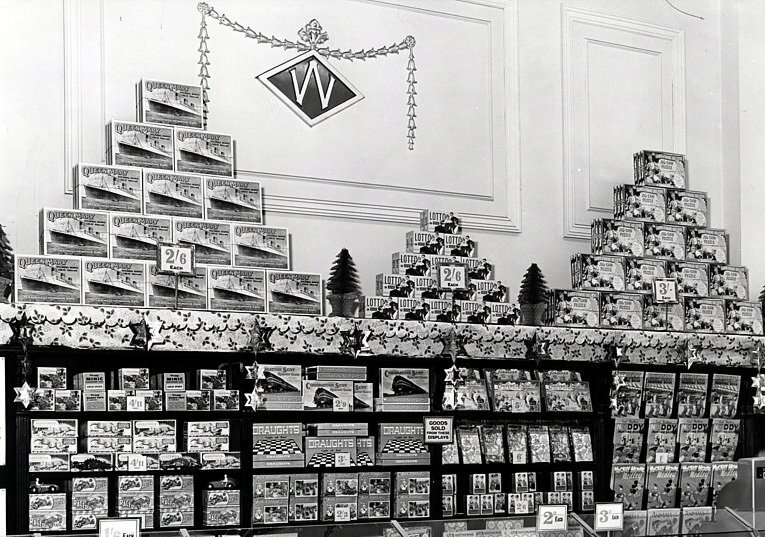 Pyramid displays like this had been a Woolworth's signature since its earliest days in the UK, and were used throughout the chain's time at the heart of the High Street. The picture shows the elaborate layout of the Christmas 1951 selection of Boxed Games in the Pontypool, Monmouthshire (Gwent) store in Wales. In the foreground, some of the pocket money items on the personal service counter were still tuppence or threepence, (between 1 and 1½p), but on the wall the most expensive item, an 'Intric' model car from Minic is four shillings and elevenpence (around 25p). Other items include a model of the latest ocean-going liner, the Steam Ship Queen Mary for two shillings and sixpence (12½p), traditional boxed games, including Lotto and Draughts, and Annuals featuring Enid Blyton's Noddy. Such spectacular displays were not just reserved for Christmas. The picture above shows the same store, Pontypool in Gwent (then known as Monmouthshire), the previous Easter. It has a wide range of dolls on sale, along with a selection of Easter Bunnies and wicker baskets, which children used to fill with eggs that they had painted at Sunday School. In the centre of the display is an innovation in the doll range which was introduced in 1951. For the first time the chain offered black dolls in its assortment. By 1955 the range of toys displayed for the summer holidays included Mickey and Minnie Mouse buckets for one shilling and ninepence (about 4p), quoits for half a crown (12½p) and beach balls for four shillings (a princely 20p). There are also a number of toys intended for rainy days. These were best sellers in the days when many people went on holiday to British coastal resorts rather than travelling abroad. The selection includes picture books about Famous Trains for one shilling (5p), and miniature colouring books for just fourpence (about 2p). For little girls there is a choice of dolls from half a crown (12½p) to two shillings and eleven pence (about 15p). The miniature tin telephone and pillar boxes were a popular gift. Parents encouraged children to use these containers to save some of their pocket money, ready for the holidays. With more than a hundred of the thousand stores at the seaside or in major tourist destinations, the Buyers also came up with extended range of outdoor sports goods for these locations. Among other items there were tennis racquets, and a selection of buckets and spades, including some huge buckets for extra-magnificent sand castles, or super-wet parents ! By 1956 the toy range was becoming more aspirational. The cheapest jigsaw had risen in price to one shilling (5p), twice the sixpence of earlier years. Branded dolls from Pedigree added new spice to the range at five shillings (25p), ten times the pre-war limit. The Wonder Car, which is displayed on the top right hand side, became the the must-have toy of the year at Woolies. In 1956 the stores offered a choice of traditional gifts or a touch of the exotic. Chess and Draughts Boards were sixpence, with the pieces or counters sold separately. 'Chromocine' was an early version of Plasticine for two shillings (10p) per pack. The stores also offered a wide assortment of pop guns, swords and rifles for two shillings and ninepence (about 13½p), as well as cowboy suits, which came complete with a waistcoat for three shillings and sixpence (17½p). Imitation leather trousers were also available for three shillings and ninepence (approximately 18½p). A cowboy outfit with gun now cost eleven shillings or 55p, the equivalent of around £15 or $17.50 USD today. 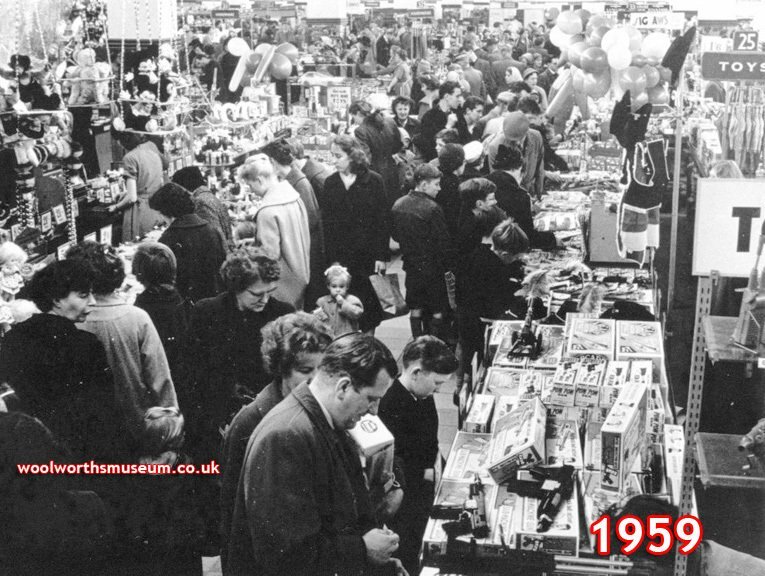 To complete our visit to the Toy Departments of the 1950s, we visit a huge, new look superstore which opened its doors in Briggate, Leeds, Yorkshire in 1959. The picture was taken on a busy Saturday in the run-up to Christmas. The salesfloor is packed with shoppers. The family group in the foreground are selecting a Christmas present. The son is admiring a Fifties favourite, an Airfix Construction Kit, from a range that was pioneered by the store chain. In keeping with the customs of the day, all of the family have dressed up to go out shopping. Both Father and Son are wearing ties, while Mum is one of the few women pictured who is not weating a beret or a hat.